Firstleaf Reviews: Best Wine Subscription Service for You? Firstleaf Review: Is It the Best Wine Subscription Service for You? Firstleaf is a personalized wine club that promises to send you a curated collection of affordably priced, award-winning domestic and international wines each month based on your feedback from previous orders. 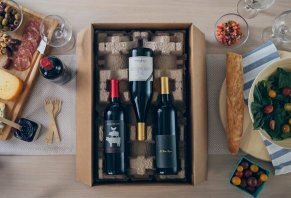 A Firstleaf company representative told us that this wine subscription service was launched in early 2016 by founders Philip James and Erik Steigler. According to an internal interview that Firstleaf shared with us, Philip started Firstleaf with the goal of ‘creating the most customer-centric wine club’ available. That’s one reason why Firstleaf has partnered directly with wineries and winemakers; to remove the middlemen (distributors and retailers) and create a direct-to-consumer pipeline for fine wines. The company claims to be the only wine club that continuously tailors their deliveries to your preferences. Does this hold true, or should you commit to a different club? Let’s look closer at the details. Firstleaf is targeted towards people who enjoy wine and value convenience but feel overwhelmed with the process of selecting bottles for themselves. The idea behind Firstleaf is that the brand sends you bottles of wine on a regular basis, which you then drink and rank through your online account. The company takes your feedback into account for the next order, meaning that they are continuously honing in on the varieties you like best. When you sign up for a Firstleaf membership, you will qualify for an introductory shipment of six bottles for $39.99, including shipping. The company assesses which six wines to send you based on your results from an introductory test. This test has three questions that determine your preferred wine region, whether you like whites, reds, roses, or a mix of all three, and how many bottles you drink per month. Firstleaf offered three-bottle introductory orders when I signed up for an account, so my preferences for mixed-region, mixed-type wines resulted in an introductory order of a 2017 Jacks and Swan Cellars Pinot Grigio, 2014 Le Douleur Exquise Red Blend, and a 2017 Gilded Letter Zinfandel. Once you sample your wines, you can rank them on Firstleaf’s website by giving them a “thumbs up,” “thumbs down,” or leave them unranked for a neutral ranking. There is also space to record your comments for additional feedback. With this information, Firstleaf will create a club order of six wines that are shipped out approximately one month after your first order (you can adjust the arrival date as desired). The cost per club order is $79.95 for six bottles with $9.95 for shipping, for a total of $90 before tax. Alternatively, you can also order six bottles of a favorite wine from your sample for the same price. When I tried my wines, I preferred the red blend to the other two and ranked each wine accordingly. My next shipment included more red blends, as well as a Merlot, Sauvignon Blanc, and Zinfandel. I found that I enjoyed all six of the second shipment significantly more than the first, even though I didn’t care for the sweetness of the first zinfandel. The more rankings you complete, the company states, the more you will enjoy each subsequent shipment. In my limited experience with this service, that proved true. When you sign up for a Firstleaf sample, you are enrolling in their subscription program, which can be tweaked to the frequency you most prefer. Because wine can’t be dropped off without the signature of an adult over 21, Firstleaf recommends shipping your order to your place of employment or to a verified UPS access point. Regarding returns, the company states that they will credit you for every bottle you aren’t satisfied with. You can contact them directly at 1-800-461-7203 or at service@firstleaf.club. Is Firstleaf Wine Any Good? Firstleaf claims that they sell quality wines at a discount compared to other retailers. Does that match reality? I looked at the stats of the nine wines I received to get an idea of what Firstleaf’s selection looked like. What can we learn from this chart? For one, Firstleaf wines are difficult to find off their website. Of the nine wines I received, just one (NV Vinho Verde Ciconia) was available at more than one online retailer. The other wines were only found at BevMax, a wine and liquor superstore. These findings imply that most Firstleaf wine falls under the category of private label. What Is Private Label Wine? According to IBWSS and WineFolly.com, private label wine is sourced from the wine manufacturer but managed entirely by the retailer. This can be a benefit for the wine industry because it cuts out the middleman and gives distributers a large portion of the profits. The International Bulk Wine and Spirits show states that the private label wine market has doubled in the past decade, and it now accounts for almost 10% of total wine sales. Even so, there’s some difference in opinion about whether this trend is good for the final customer. For instance, Kelsey Chesterfield from the Gold Medal Wine Club told us that private labeling can make cheap wines seem more appealing. Since the buying costs for bulk juice are so low, she told us, companies can create fancy labels and sell each bottle for many times its value and make a profit off unsuspecting customers. However, the two resources above noted that private label wine isn’t necessarily lower quality than regular. For example, many wineries sell off their top-quality wine to a private label because it guarantees them a buyer. This quote makes it clear that they have a vetting process for the wines they sell and are devoted to delivering quality bottles. Do customers agree with the results? Let’s look at their reviews to find out. What Do Firstleaf Reviews Tell Us? To get a better idea of what previous customers thought of Firstleaf wine, we looked at reviews from WineClubReviews.com and DrinkHacker.com. Wine Club Reviews reports that they believe FirstLeaf company does a decent job of sourcing wines from lesser-known regions in Europe, though most of their domestic wines seemed to originate from lower-cost areas of inland California, rather than Napa or Sonoma. They concluded that the variety of grapes used made Firstleaf a good way for novice wine drinkers to discover new favorites, though they thought the overall quality was only slighter better than average for the $15 price point. On the negative end, we noticed complaints from Firstleaf customers who didn’t realize they were signing up for a subscription service, and from those who struggled with delivery because they needed to be home to accept the wine. Christopher Null’s review of Firstleaf on DrinkHacker revealed he thought that the company’s initial questionnaire was too limiting to determine his preferences. Likewise, he noted that the wine ranking system was too basic to be valuable. In general, he found the quality of the wine to be hit or miss, which he found consistent with the quality control issues of bulk wine production. Overall, we think these reviews show that Firstleaf is a hit with people who understand what they are committing to – a subscription service for moderately-priced, predominately private label wine. How Does Firstleaf Compare to other Wine Subscription Companies? Numerous e-commerce companies are using personalization technology to improve their offerings for subscribers, and the wine industry is no different. Firstleaf is one of several companies that lets members received wine through the mail on a regular basis, and others include Club Winc, VineBox, and Tasting Room. Looking at the details here, it’s clear that these four wine clubs each differentiate themselves from the others. Firstleaf offers simplicity with a streamlined taste preference quiz and ranking system, while Club Winc makes sense for people who only want a few bottles of wine each month. Tasting Room and VineBox both differ from Firstleaf because they send you sample-size wines for your first order. However, Tasting Room will send you full-sized bottles within each subsequent order while VineBox continues to send you single servings with the option to buy full bottles at a discount. A Firstleaf subscription, in contrast, starts with three discounted full-sized bottles of wine. It’s also important to notice which companies offer private label wine. Of the four we looked at, only WineBox doesn’t sell private label wine. Saying that, the price per glass is significantly higher than the other three companies, which follows the logic that private label wine tends to be considered lower value than wines bottled and sold by a vineyard. Pricewise, the three companies selling private label wine are relatively comparable. Firstleaf’s price per bottle comes to $15 when you include shipping, Club Winc is roughly $15.25, and Tasting Room totals between $14 - $16.50. Club Winc and Tasting Room offer more flexibility in the amount of wine you receive each subscription, order, but all three companies also allow you to buy their wines a la carte from their online stores. Does one brand’s wine taste better than another? This is difficult to determine, as a wine’s value is mostly subjective. Even trained experts often struggle to differentiate between cheap and expensive wines, and one study from the University of Bordeaux revealed that dyeing white wine red convinced the majority of tested taste experts that it was red. For more information on this topic, we talk extensively about the personalization of wine preferences in our reviews of Club Winc and Tasting Room. Our View: Is Firstleaf Worth It? Through this research process, we’ve found that Firstleaf is a value-oriented wine club that should appeal to novice wine drinkers who want to learn more about different types of wine without having to select bottles for themselves. Every order comes with informational cards about each bottle, meaning that members will learn more about wine and their personal taste preferences. The Firstleaf website is simple to navigate, customer support is quick to answer questions, and my orders were both processed promptly and arrived within a few days. You can also cancel your subscription without issue, so long as you do so before the start of the next billing cycle. This club is likely best for people who want to learn more about wine in a relatively affordable way and who want the convenience of a wine delivery that is tailored to their tastes. It’s probably not ideal for anyone opposed to private label wine or who is looking for deals for fine wines. If you want to subscribe to a luxury wine service that doesn’t use private labeling, you might be better off with a company like VineBox. Firstleaf positions itself as an economical option for a wine club, but the reviews we read showed that many members loved the wine quality. You can decide for yourself whether you like it by signing up for the discovery deal of six bottles of wine for $39.99. Write a Review for Firstleaf!